The union representing employees with Dean Singleton’s Bay Area News Group are alleging staff cuts were retaliatory, the Associated Press reported Tuesday. The Northern California Media Workers Guild filed a grievance with the National Labor Relations Board, concerned that the 13 percent staff reductions at the Contra Costa Times targeted union organizers. The layoffs came two weeks after staff voted in favor of union representation at the Contra Costa Times, and includes several strong proponents of unionizing the Times’ 225 eligible employees. A quick and belated blog post to announce that Spot Us, a nonprofit that will pioneer "community funded reporting," will be working with the Public Press to help finance local enterprise reporting here in San Francisco. I've spoken with Michael Stoll about the concept. Indeed, he has been instrumental in helping me conceive of ways to design the platform to best aid and abet local enterprise reporting. If you go to the Web site (www.spot.us) you can leave your e-mail so that you will be informed when we launch. There you can also learn more about how the project will work. I am available to discuss the details as well. Feel free to contact me. I am particularly keen to hear from local freelance reporters. My goal is to get you paid to do what you do best: report on important issues. Michael and I are very open to collaboration -- so it isn't an affront to the Public Press at all. In fact, as I see it, and I believe Michael feels the same, Spot Us is a tool that the Public Press can use. In the broad range of organizations that question the expanding role of marketing in public life, a group called the Anti-Advertising Agency Foundation For Freedom stands among the most ardently opposed to the traditional but uneasy co-existence of advertising and the editorial craft. CHICAGO -- The most creative and forward-thinking professionals of our time work in marketing. The Anti-Advertising Agency Foundation For Freedom wants them to quit. And they're offering cash. The AAAFFF was organized by Steve Lambert and Anne Elizabeth Moore, both of whom have much to say about the world of marketing -- some of it tongue-in-cheek, some quite serious. Their work to eliminate advertising in grocery stores across the country and bus stops in Oakland has garnered national attention. Which, presumably, is the point. 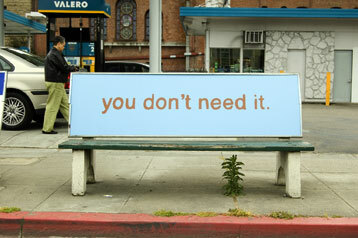 The group aims to question the role of advertising in public space "through constructive parody and gentle humor." "Our work will de-normalize 'out-of-home' advertising and increase awareness of the public’s power to contribute to a more democratically-based outdoor environment," says its mission statement. The contest might not solve the great debate, but it’s a start to rid the streets and cyberspace of mental clutter. The contest aims to do this one person at a time. Providing "tips, training, and networking opportunities" and the Anti-Advertising Agency says that it has known "you've always wanted to devote yourself solely to those pursuits." Lambert's resumeof art projects and published work is thought-provoking, as is Moore's work with independent publishing. Neither is primarily focused on journalism, but their efforts to get a consumerism-drenched culture to consider alternatives is inspiring. It's the same old song, second verse: The old ways of paying for quality journalism are slowly dying and will continue to decline until a new model that works has been created. Though what the best news model looks like is always up for discussion. American Journalism Review's senior editor, Carl Sessions Stepp, wrote a bulleted list of ways to succeed with the new newspaper. "Maybe it Is Time to Panic," Stepp says. Hey, he's singing our song! My own observation, based on years of working in, visiting and studying news operations, is that noncommercial journalists have no monopoly on commitment or quality. Large media corporations have the resources and clout for in-depth coverage, investigations and enterprise. No matter who pays their salaries, journalists tend by tribal habit to be aggressive, competitive and mindful of public service. Yet in visiting less-commercial newsrooms and interviewing their journalists, I was struck by the palpable sense of relief and liberation, the exhilaration of professional autonomy. When journalists feel in control, audiences gain something extra and special: news, analysis and opinion tailored to community and civic needs by professionals who care deeply. Following up on these observations by writing a laundry list of ways to improve newspapers is a start. But the time to implement new ideas is now. Let's hope that "panic" is only the first emotional response to dealing with this crisis, not the last. In the midst of a year that has seen a truly existential crisis for print journalism, it's instructive to ask ourselves just what kind of paper product newspapers are selling these days. The photo above is what landed on my front stoop last Sunday. Inside the advertising bag was a free sample of what's reputed to be some of the most absorbent pulp money can buy ... plus the San Francisco Chronicle. When the going gets tough ... use J-students to report? The Boston Globe is the latest Top 30 newspaper to use alternative methods to gathering news. For the Sunday Globe it was eight journalism graduate students from Northeastern University for a Page One piece "advocating for senior citizens." The Public Press will make a prominent showing at the Journalism That Matters conference at the headquarters of Yahoo Inc. at the end of the month. More than 150 high-tech and media pioneers from a range of industries are meeting for a “concept/design mashup” as part of a nationwide conversation — one aimed at making media reform tangible by creating new products and services that support the core social missions of journalism. Media reformers across the country have long complained that the current print media paradigm is in need of an overhaul. The Public Press concept is one effort to make up for inadequacies in the business model that has, until recently, supported robust print journalism. Approaching those new -- and as yet unknown -- business models has become a growing topic for debate. One illuminating sign was the publication late last month of the annual State of the News Media report by the Project for Excellence in Journalism. Bit by bit, the Public Press project is getting noticed. I just got off the air from an hourlong interview with Jonathan Rowe, host of the talk show "America Offline" on KWMR, the community radio station in West Marin County.